Using SalesHandy’s read receipt Outlook plugin, you can track email opens in real-time and get live desktop notifications of it, without the recipient knowing. It does not require you to request a read receipt from the recipients. Emails sent using SalesHandy’s Outlook tracking feature will look like a normal one, without any mark-able difference from a standard email. Install SalesHandy’s Outlook Add-in and sign up to create a new SalesHandy account. Then open the Outlook app and fill in your login details. 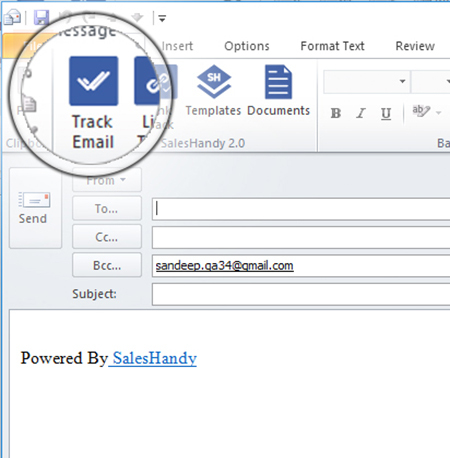 To track read receipts in Outlook, while composing your email, select the “Track Email” button. Outlook read receipt tracking is enabled when the tracking button turns Blue. After that, all emails that you send will be tracked, without the recipient’s knowledge. SalesHandy helps you know an email’s open rate and its individual open history. It also tracks replies to a given email. Also, you can export the complete Outlook read receipt report in CSV format. With SalesHandy, you can also track sent email’s open time, location, and device used to read it. Based on this data, one can get to know about recipient’s engagement level and make an informed decision related to setting up a follow-up email or call. HOW DOES OUTLOOK READ RECEIPT CONCEPT WORK? It’s a simple but effective process. While sending your email, SalesHandy’s plugin inserts a 1×1 pixel image with it. When the recipient opens this email, the embedded image also loads, alerting our servers with the IP. Right then, you will receive a SalesHandy desktop notification. It will also notify of additional information such as when, where, and with what device the mail was opened. 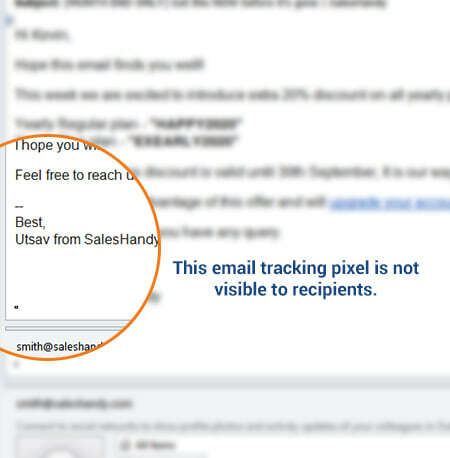 SalesHandy’s tracking pixel will never affect your email’s Spam score or deliverability or its presentation. METHODS TO ACCESS OUTLOOK READ RECEIPT WHEN EMAIL IS OPENED? There are two methods to get read receipt in Outlook. Whenever a recipient opens an email with the tracking pixel, the sender will get an instant desktop notification as an Outlook read receipt. In case a user misses the live desktop notification, one will have an option to view the read receipt stored in SalesHandy App’s activity feed and reports. Users can visit it later to see the history of Outlook read receipts. HERE IS A SHORT VIDEO TUTORIAL ON HOW TO INTEGRATE SALESHANDY WITH OUTLOOK. ALSO, KNOW HOW TO ADD READ RECEIPTS IN OUTLOOK. Are there any limits to Outlook read receipts tracked in a day? No, you can track unlimited emails in a day and can receive Outlook read receipts. Will my recipient know that they have got a tracked email that generates Outlook mail read receipts? No, all sent emails will look like a standard email message, but they will have “Powered by SalesHandy” tag if you are a free user. To remove the SalesHandy branding you need to upgrade SalesHandy. How to view Outlook read receipt information if the desktop notification was missed? You can access read receipt history from the SalesHandy app, activity tracking dashboard. You can also get an update on an email open rate, last open time, reply information and get an option to mute notifications. How to enable read receipt in Outlook? It’s pretty simple! First you need to add SalesHandy’s Outlook plugin and sign up. Then all you need to do is just ensure, before sending your emails that, the “Track Email” button is highlighted. 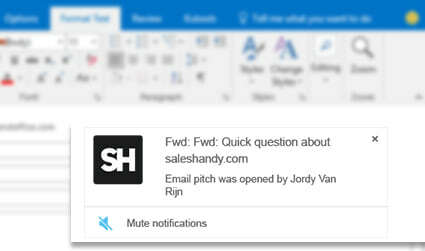 This will enable email tracking and generate Outlook read receipts when your emails are opened. Know what happens after you hit send! Get Outlook Read Receipt without the recipient knowing.